Just too beautiful hand dyed indigo round cushion cover. The versatility of this gorgeous pillow is limitless. Bold, fun and effortlessly cool, these pillowcases are soft and smooth, made from 100% cotton. 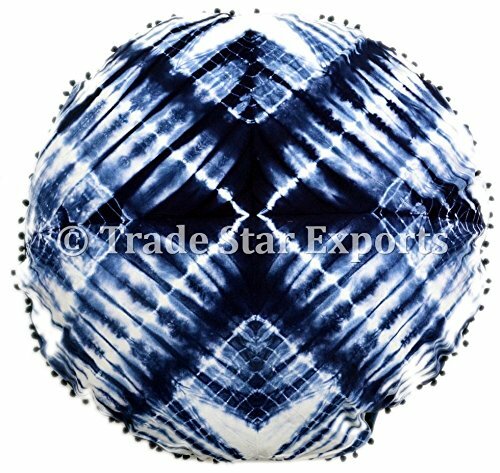 Indigo is trending in home decor, you can place them in Bed room, Living room or even use them for decoration in your house. Bring color into your home for spring with this super groovy round shape floor pillow poufs with happy pompom borders. Indian Bandhani, a traditional form of tye and dye, began about 5000 years ago. Also known as Bandhni and Bandhej, it is the oldest tie and dye tradition that is still practiced. The Art of Bandhani (Tye & Dye) is highly skilled process. The technique involves dyeing a fabric which is tied tightly with a thread at several points,thus producing a variety of patterns. Soft, comfy, and oh-so-pretty round floor pillows that are great on their own!! Note : Please note that these are covers only and the Insert/fillers are not included. : Actual Product may differ slightly in color then the photographs depending upon the screen resolution. Use For Sofa, Couch, Living Room, Bedrooms, Home Decor Etc. If you have any questions about this product by Trade Star Exports, contact us by completing and submitting the form below. If you are looking for a specif part number, please include it with your message.